Readers of this blog probably already recognize that much of Fox News "reporting" is thinly disguised political propaganda that often diverges from reality and/or truth. Add to the list of faux scandals the puffery over government investments in alternative energy. "A colossal waste of taxpayer dollars" is among the nicer things said by the Fox bloviators. Well, it turns out they were, uh, wrong. The alternative energy investment program is actually turning a profit. When venture capitalists, guys like Mitt Romney, invest money in companies they know that not all the investments pay off. Some lose money. Their goal is to end up with a positive bottom line. It's called "risk/reward". Now that they've been safely re-elected, Republicans in the state Senate have found the courage to do something about Michigan's worst-in-the-nation roads. Lame duck Majority Leader Randy Richardville has pushed through legislation which would change the gas tax to a charge against wholesale prices, beginning at 9% in 2015 and ratcheting up to 15.5% by the beginning of 2018. The Senate Fiscal Agency projects the tax hike would amount to between $781-million and $1.5-billion when fully implemented, depending on gas prices. In exchange for Democratic votes needed to pass the bill, Republicans apparently agreed not to vote on legislation changing Michigan's electoral college or repeal the state's prevailing wage law. While not explicitly confirmed by Democratic leader Gretchen Whitmer, she hinted that an agreement had been made to avoid issues that are "too overtly partisan" which is code for electoral college and prevailing wage changes. A coalition of progressive groups is urging the Legislature to look at paid sick-day legislation as a matter of both good social policy, and because it is good business. “This past election showed that the public supports paid sick days and family leave laws,” said Danielle Atkinson, director of Mothering Justice, noting that places like Massachusetts, Oakland, Calif., and two cities in New Jersey passed paid sick day legislation in the November 4th election. In a recent poll, 57 percent of respondents, including 79 percent of Democrats and 41 percent of Republicans, said it was “very important” for lawmakers to consider new laws to help keep working families economically secure, including ensuring workers the right to earn paid sick days. The press conference served as a launching point for the groups to begin organizing around the issue for the next two years. They believe that the beginning of a new legislative session requires a renewed push for priorities that benefit all Michiganders, including paid sick day legislation. Democrats are finally figuring out what Republicans have known for a long time: the real control of the American policy agenda is at the state level. Republicans now control 68 of the 98 partisan state legislative chambers, and hold 31 governorships. There are 23 one-party states controlled by the GOP (including, of course, Michigan); Democrats only fully control seven. A conservative Washington D.C. outlet, the Washington Freedom Free Beacon, has uncovered a plan among big-money Democrats to finally focus on winning back control of states in time for the 2021 nationwide redistricting, because it is redistricting that has made the U.S. House the semi-permanent property of Republicans. The plan, according to the Free Beacon, will funnel $100-million into state legislative races. This is something Republicans and their billionaire funders have been doing for awhile. In this cycle, the Koch-funded Americans for Prosperity spent hundreds-of-thousands in targeted state House districts. Their biggest win was knocking out Democrat Teresa Abed, the only Democratic incumbent to lose. She was the target of an estimated $200,000 in direct mail advertising from AFP. She lost by 310 votes out of 35,000 votes cast. 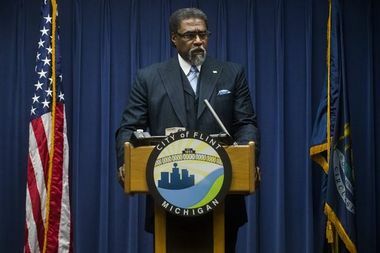 Governor Snyder's Emergency Manager for Flint has decided that he don't need no stinkin' elections. He's just going to appoint replacements for two city council members who resigned. 'Nuff said. Thank you Benevolent Lord Snyder for your superior judgement. That conclusion comes from a Rasmussen survey which shows 61% of Americans OPPOSE internet neutrality legislation because they like their internet service the way it is. The problem: net neutrality, which would regulate the internet as a public utility, is designed to maintain internet service the way it is with no money-driven winners and losers. Without net neutrality, the internet providers would auction off the fastest transmission speeds to the highest bidders. The little guys would be left in the dust. Maybe it wouldn't be a return to dial-up modem days, but the likelihood of a throttle on many websites becomes a reality. In a December, 2010 Rasmussen poll 56% said FCC regulation of the internet would be used to promote a political agenda and lead to censorship. That's like saying the FCC is going to censor telephone calls, or use your phone service to promote Kenyan-Muslim socialism. It may be paranoia, but Comcast/ATT et. al. are making the sale. Ed P As a Republican who works in the tech industry I can say that this statement shows you either have no idea what you are talking about or you are bought and paid for by the American Cable monopoly. This is amazingly an stupid statement and is disheartening. Keith F Ted, I am as conservative as they come…. I want government out of just about everything… and I hate to say it, really hate to say it, but Obama is right on this one. I do not want my access and internet speed controlled by my ISP. It will be. The internet has been an open forum with little to no restrictions, that will change and not for the better. Bottom line, do not go against freedom of the net just because Obama is for it. Even an old blind squirrel finds a nut once in awhile. Joey C As a Republican whom also works in IT like Ed… You have no clue what you are talking about or you are company bought and paid for. A Jinnie M Goddammit, stop making my party look like morons and look up net neutrality. It doesn’t mean what you and your speechwriters think it means. Marvin E Ted Cruz, as a tech and fiscal conservative in Texas who generally votes Republican, I am incredibly disappointed by your completely inaccurate statement. Please read up on what Net Neutrality actually is and fire any staff you have who are advising you on technical matters. Sam A Senator Cruz, you are wrong on this one. As a conservative voter and IT professional, I can assure you that Net Neutrality is a GOOD THING. Internet providers (who are also content owners) can’t be trusted (as has already been proven) to allow consumers equal access to content from their competitors. This is why the government needs to ensure Net Neutrality as it protects the consumer from the bias of their Internet provider. This is especially true since we don’t have real competition in this space. David V Texas employer here… This is really the wrong issue for you. Drop this quickly and move on to something else before it’s too late. You’re starting to look like a Tea Party whacko growling for his corporate masters. Move on before you embarrass the Republicans out of the next presidency. 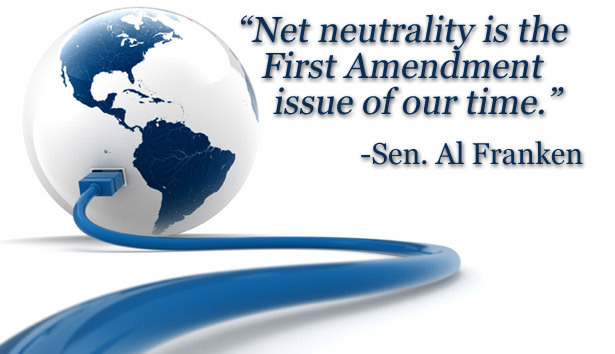 Net neutrality is about ensuring a free market. America loves a free market. But hey, be against free markets and America. It’s cool. I’m sure no one will think of you when their Netflix slows down who wouldn’t have before. Jimmy L Wow. I am embarassed that I supported you Ted. Face palm. I think it’s time that I “unlike” your FB page. Eric E Kim Well I guess I’m now a democrat. Thanks for making it easy for me Ted. Don’t fck with my internet. Paul J This clearly indicates that Ted is fighting mental health and, in his mind, he is winning. How far removed from commons sense can a person be? Yet another Republican soiling the waters and creating more confusion. Net neutrality is to everyone’s advantage! No CORPORATION can buy up and control the internet. THAT is what Cruz does not like. Remember before the election when every cable channel spent half their time tracking Ebola cases, possible Ebola cases and could-it-become Ebola cases? When the nightly network newscasts led with 8-to-10 minutes on Ebola? When Republicans (and a few Democrats) mounted their high horses to scream that the Obama administration was blowing it and putting America at risk for a modern-day version of the Black Plague? Yah, that was two weeks ago. Before the election. Election over. Obama's image damaged a little more as someone who really isn't protecting America. And nobody in this country – NOBODY – has Ebola. No American – NONE – has died from an Ebola infection. But the Ebola "crisis" did its job, helping drive the President's approval numbers a little lower just in time for the mid-term election. Pathetic. Driving American opinion is like herding sheep. All you have to do is bark a lot.